CMMS Justification is often required when maintenance managers need funds for CMMS Systems. We often get requests for assistance with justification. Over the years we have gathered some good CMMS justification material that you may find helpful. 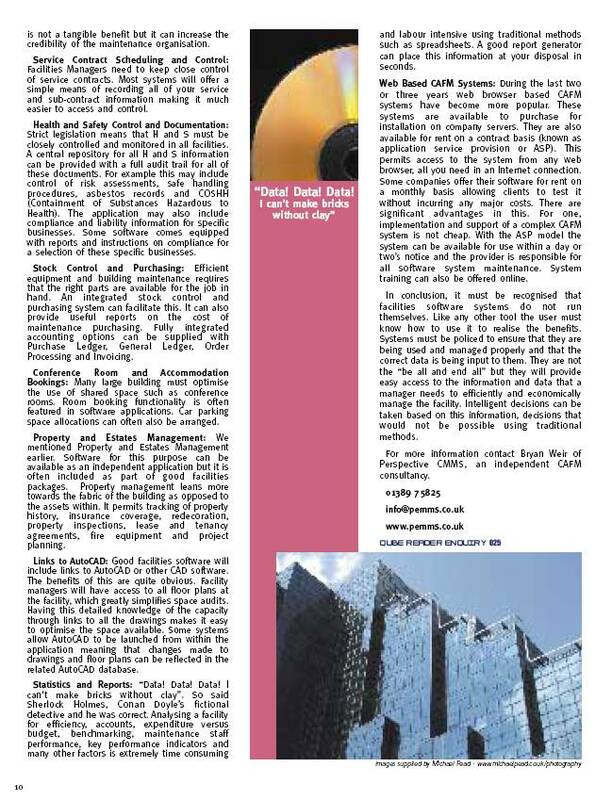 The two page article "The Benefits of Maintenance Software" was published in the August 2006 issue of Qube Magazine. 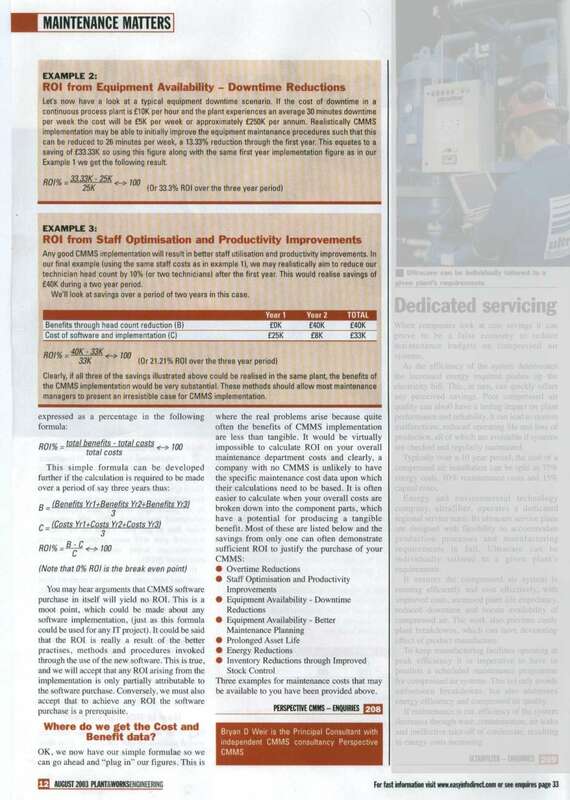 The article "Maintenance Control: From Zero to Hero" was featured in the Feb 2005 issue of the Maintenance Journal (Australia). Click the image on the right to display this article about a simplified way to control your maintenance activities. 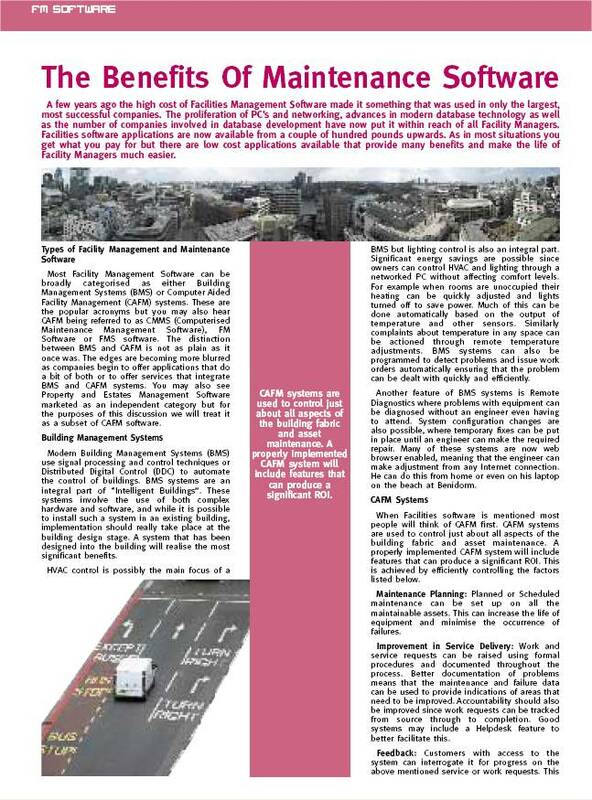 Snippet: "You can just see the eyes of many maintenance managers in many small companies glaze over at the mention of CMMS, RCM, TPM, FMEA and the other maintenance related acronyms that are often introduced in discussions on maintenance and facilities management. Big companies often employ some of these initiatives in their maintenance organisations because they can afford to do so. The reality for many cash-strapped, smaller businesses is quite different. Most of their maintenance is reactive. Plant and equipment problems only get dealt with as they arise and this is usually when it is too late to avoid the resulting disruption to their production or processes. The article "Software for Hire" was featured in the March 2004 issue of Plant & Works Engineering Magazine. 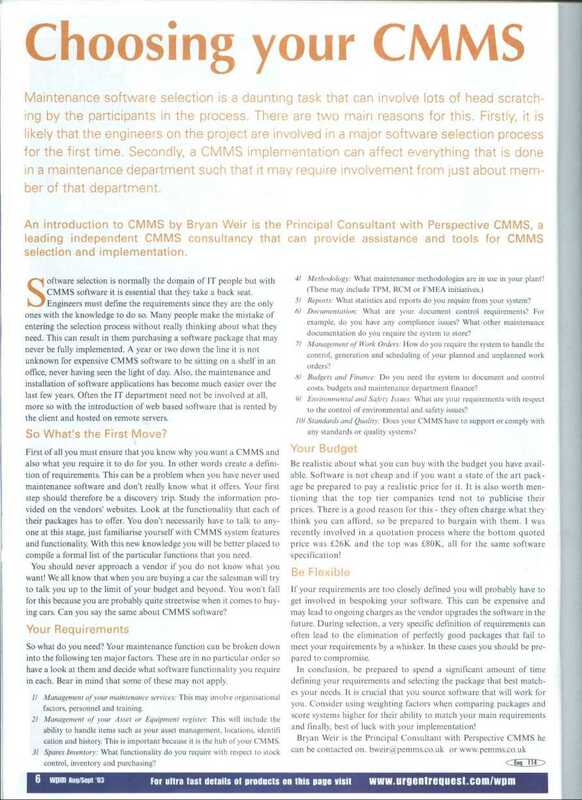 Click the image below to display this article about the rental of CMMS software and Application Service Provision (ASP). SNIPPET: "There has been a trend in recent years towards the use of remote software services through Application Service Providers. These are companies who make software applications available via the Internet to users who, rather than buying software, pay rental fees for it. The software does not have to be installed locally, the application being available through any web browser, and all support and maintenance is handled by the service provider." The article "Choosing your CMMS" was featured in the Aug/Sept 2003 issue of Works, Plant, Maintenance Magazine. 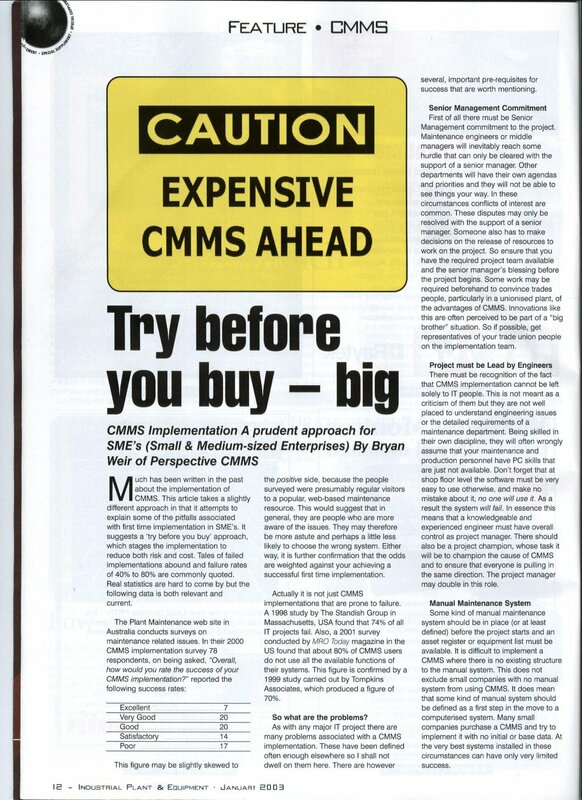 Click the image on the right to display this great article about CMMS selection. SNIPPET: "Maintenance software selection is a daunting task that can involve lots of head scratching by the participants in the process. There are two main reasons for this. Firstly, it is likely that the engineers on the project are involved in a major software selection process for the first time. Secondly, a CMMS implementation can affect everything that is done in a maintenance department such that it may require involvement from just about member of that department." 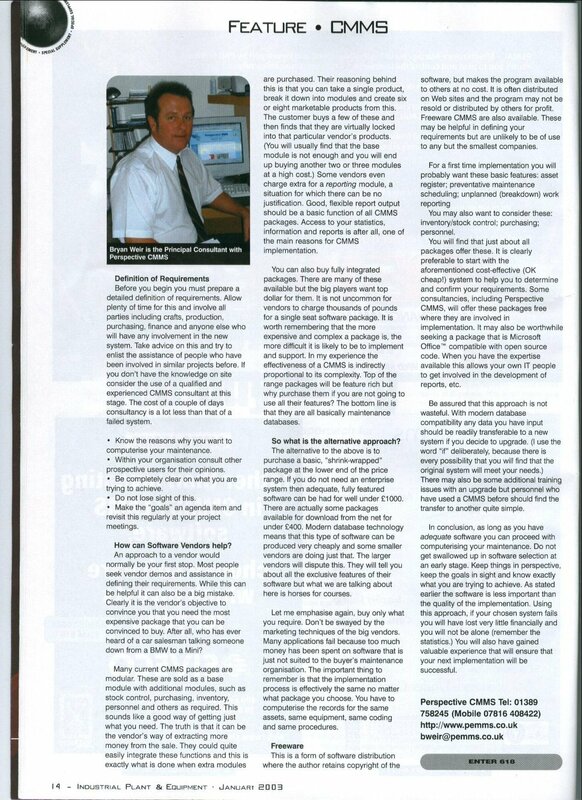 The article "The Case for CMMS" was featured in the August 2003 issue of Plant and Works Engineering magazine. This is an article on CMMS Justification. Click the image on the left for page 1 and that on the right for page 2 of the article. SNIPPET: "A Return on Investment (ROI) calculation results in a value that represents the benefits received from a project against the total costs of the project. That's basically all there is to it, but if you ask ten different accountants how to calculate ROI the chances are that you would get ten different answers. A certain amount of "poetic license" can also be evident, depending on whether the person crunching the numbers is "for" or "against". This does not mean that it is impossible to arrive at a reasonable and sensible ROI figure." 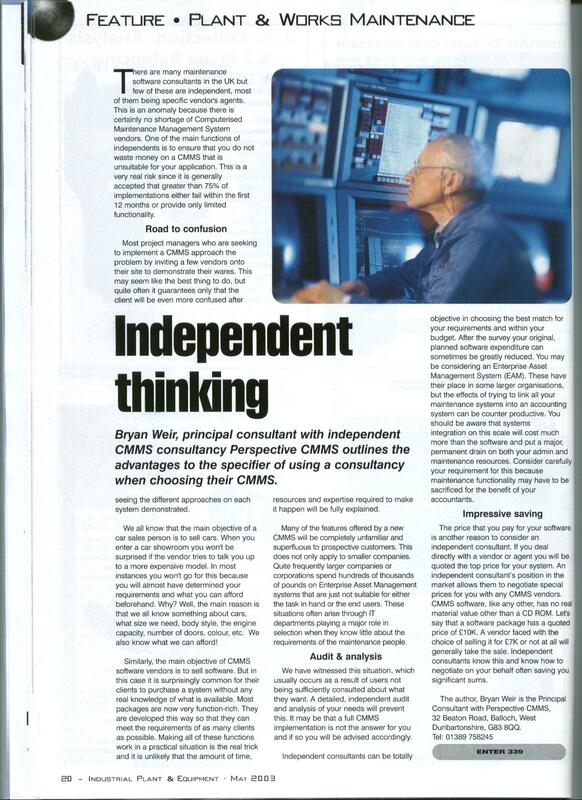 The article "Independent Thinking" was featured in the May 2003 issue of IP&E supplement on CMMS. Click the image on right to display the article or request a copy. SNIPPET: "There are many maintenance software consultants in the UK but few of these are Independent, most of them being specific vendor's agents. This is an anomaly because there is certainly no shortage of Computerised Maintenance Management System vendors. One of the main functions of we independents is to ensure that you do not waste money on a CMMS system that is unsuitable for your application. This is a very real risk since it is generally accepted that greater than 75% of implementations either fail within the first 12 months or provide only limited functionality." 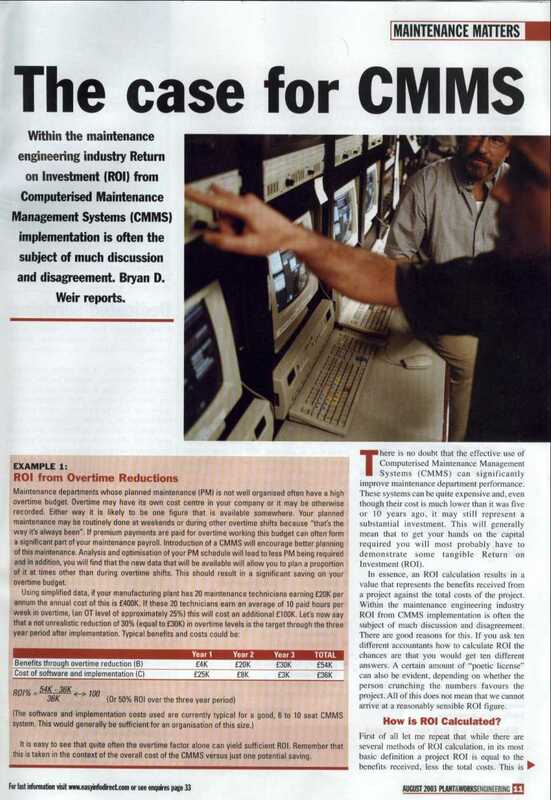 Our highly popular and often reproduced article "The Prudent Approach to CMMS Implementation" was featured in the January 2003 issue of IP&E. Click the images below for each page or contact us to request a copy. Snippet: "Much has been written in the past about the implementation of CMMS systems. This article takes a slightly different approach in that it attempts to explain some of the pitfalls associated with first time implementation in SME’s. It suggests a “try before you buy” approach, which stages the implementation to reduce both risk and cost. Tales of failed implementations abound and failure rates of 40% to 80% are commonly quoted. Real statistics are hard to come by but the following data is both relevant and current ..."
Learn about Managing your Equipment Maintenance using Software Applications with our Unique CMMS "Insider's Guide."